When attendees took their seat for the 2018 H.M.S. Richards Lectureship held October 28–29, they little expected the treat that was to come. The annual H.M.S. Richards Lectureship on Biblical Preaching, coordinated by Hyveth Williams, chair, featured guest lecturer Donald Sunukjian of Biola University. Sunukjian’s lecture taught seminarians how to use their words to create pictures in the minds of their audience, in order to keep them engaged and attentive. He highlighted the importance of doing this by noting that “today’s culture is dominated by images” and stressed that speakers have to know how to take hold of the mind’s eye. Expand on the biblical author’s original images so that listeners can form a mental picture of them. Create contemporary images similar to the author’s to convey the same meaning. Describe contemporary situations and scenarios of how the biblical truth “shows up” in the lives of listeners. For Monday’s worship in the Chapel, Sunukjian did just that. He artfully demonstrated the use of storytelling as an attention grabber and a handy exegetical tool. Seizing 1 Corinthians 10:13 as the basis of his sermon, “Quick as a Wink and a Snail’s Pace,” Sunukjian expanded the meaning of the text and discussed applicable contexts which highlighted the faithfulness of God and relevance to the lives of the audience. During the second portion of his presentation, Sunukjian deftly shifted his presentation style, demonstrating the kind of speaking he had been describing throughout his lectures. The lecturer-turned-storyteller held the audience in rapt attention as he used his words to recreate scenes from his own experience with temptation and God’s faithfulness. His was an experience that the seminarians could all relate to: ministry envy. The genius of his storytelling laid not in his transparency or humor but in his masterful use of story to explain the innards of the text he had so deftly pried open. Shifting again, the storyteller, now turned pied piper, ended by leading the unsuspecting congregation to feel the weighty sense of honor toward them that God has and desires to convey in every pre-weighed trial. The apostle Paul’s point was made. 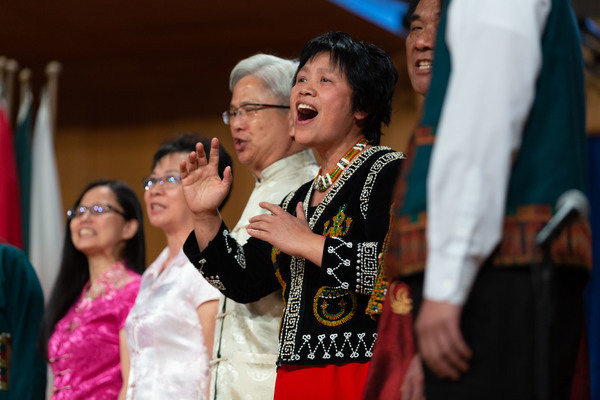 With that accomplished, Sunukjian was done and, after a brief pause, his audience erupted in sounds of praise to God and acclamation for having experienced such a meaningful and surprising treat. DVDs of Sunukjian’s presentation may be requested from Hyveth Williams at hyveth@andrews.edu.